After gaining solid experience in the Telecom industry, Hok left Sydney in 1996 to join a leading multinational telecommunication supplier in Asia, and subsequently spent 20 years in various Senior Executive positions in driving telecom services growth. He lived and worked in Indonesia, Malaysia, China and Singapore during this period. He was primarily responsible for telecom services businesses and passionate about executing the services growth strategies for the company and achieving excellent results. For example, he led the company’s telecom services growth from 1 BRMB to 5.5 BRMB revenue from 2004 to 2010 in China. Hok believes the key success factors included strong leadership in managing a diverse culture, defining and implementing the chosen strategies, investing in core competencies such as management skills, his sales and technical expertise, and implementing strategic joint venture and outsourcing strategies. Upon his return to Adelaide in 2015, Hok became a CEO and an investor in a winery in South Australia where he aggressively drove the company transformation to focus on export to China. He secured funds from key investors from China to support the export growth initiatives such as organisation development, increased production and partnership. He now dedicates his time as an independent director, a licensed Financial Adviser and stockbroker. 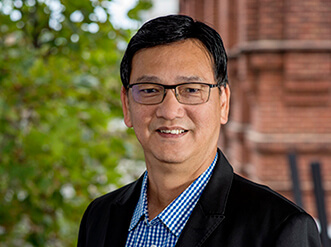 Hok is an Australian citizen and his education includes a Master of Electrical & Electronic Engineering from Canterbury University, New Zealand and an MBA from UTS, Sydney.